2018 music video selection. by jaymes young. To kick off 2018, we're making a music video to complement Jaymes Young's song, I'll be Good. Our Short Film selection this year will be a horror that's sure to leave a pit in your stomach, fearing every minute of the film. We're doing something we haven't since 2013 and creating a Feature film. The details regarding this film will be presented in the 2018 Fall Keynote, in September. 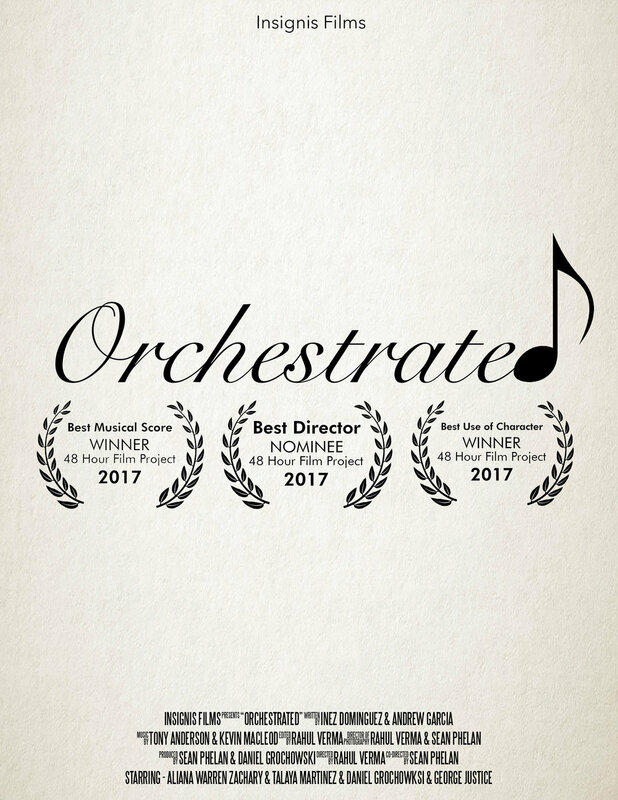 We're excited to announce the release of our 2017 48 Hour Film Submission, Orchestrated. Catch it online only. we're here to help you. no more contests. We want to thank those of you who have made our films possible. Instead of making it an unfair rush to get the first three slots, we're opening up our gratitude to everyone. Below are the conditions. if we've worked together in 2017 to the present. Email us to verify eligibility, and we'll get something scheduled. A one week notice is required. if we've worked together before 2016, or even if we haven't. A two day notice is not required, but appreciated. we just got a whole lot more integrated. Studio Binder is, as its name implies, a Binder full of our call sheets, locations, contact information, and more. It's used within the industry, with big names such as ESPN, BuzzFeed, Spotify, NBC Universal and Lionsgate using it's powerful features, we're glad to bring you the same powerful software. You will be integrated into it on a case by case basis, depending on if you are cast. This benefits you with professional looking call sheets, easy communication, and a much more direct and efficient workflow. After jumping from platform to platform, we're excited to streamline audition scheduling into one easy to use program. Acuity Scheduling is simple and easy to use and will be a valuable asset this season, and with our films in the future when it comes to audition scheduling. We've used it before, but we're moving everything audition related to Acuity. Not only is it a simple and easy to use platform, it has a great mobile interface. Sling is how we will schedule shooting days. This will run in parallel with the new Call Sheets that StudioBinder is providing us. Those who have shot with us before are no stranger to this, and we will continue to utilize this platform to schedule shifts, and use it to calculate payroll when we hit that point in our operations. Again, you will receive further detail when cast in regards to setting up an account. While this doesn't benefit you guys directly, we've moved our writing to a platform that is industry standard. This, along with the rest of our improvements are sure to distinguish this era in our existence as a filmmaking group. This has been a feature since September 2016, however, it has been severely under-utilized. Please note that we don't respond to email requests for footage. All footage requests must go through InsignisOne. "But you've been saying this for the last two years!" That is correct, but with school out for good, and our company shifting gears to something more professional, we need a title and base for you guys. Especially when we start to pay. Look for this in mid 2019, with several updates along the way. We'll be utilizing our tech in order to collaborate with everyone and with everything, effortlessly. Starting in 2019, and some specific roles in 2018, we're ready to pay you. We'll get into details when cast in terms of rates, hours, and conditions. Be ready to be part of an indie film group that appreciates its actors through payment and visibility. Just another thing that will set us apart from the rest. This, unfortunately means we're cancelling all pre-existing DVD orders, and starting now, films will only be available through electronic formats. This will include, once we get that far, paid films with extra features. Of course, cast and crew get the films for free, like always. Additionally, we're going to commit to shooting green as well. We'll recycle what we use, and be mindful of our electricity usage by shooting with natural light when possible, and reduce our carbon footprint by encouraging carpooling and shooting around rush hours, if possible. Louisa Baca appeared in our 2016 48 Hour Film Submission, Grandma's House. She was a talented member of the New Mexico Actors community appearing in several large scale productions like Better Call Saul, The Nightshift, and more. She had a great sense of humor, and helped the production move forward without any hesitation and did so with a great passion. In addition, she has done documentary work and remained strong to her Native American culture, which she took great pride in. The world, our community and those who's life she touched will miss her deeply and are so incredibly thankful for the experience they got to share with her. The world will miss a truly talented individual. Louisa Baca will receive a "In Commemoration of" in the next appropriate film. Our website will be 100% complete by August 31st. We're almost done wrapping up a state of the art experience for you and all those who visit to enjoy. We're nearly ready to go independent, but need one more push. We're looking to raise $1,000 by the time we film our feature. All donations come with rewards.